We were nine of us (6 adults and 3 children) for 11 nights. The house is a beautiful, modern place. Nothing is missing. The pool is beautiful large and with a jacuzzi. The terrace is partly covered, what a nice shady place offers. The decor is just beautiful. A modern ambience with all possible technical facilities. Many leisure facilities such as pool, air hockey, poker room, video game table, ... . The bedrooms and bathrooms are well decorated. Due to the light equipment children must be however when playing back a little. Fortunately for us this was no problem. The plant is located a bit out of the way, but for the car lovers Americans is no problem. The nearest supermarket is 10 minutes and the motorway (I4) about 15 minutes. All inquiries and little problem, the house rental fast, friendly and technically perfect processed. We are in love with the property and will be happy to come back. We stayed at this property from 29th March until 8th April 2017 as a family of three including a nine year old. The villa is practically brand new and finished to a high standard with 4 bedrooms (2 en-suite) plus a family bathroom and two spacious living and dining areas. The kitchen is well equipped for those who want to eat at home and there is a Publix supermarket a 10 minute drive away (there are also plenty of choices of places to eat out nearby). 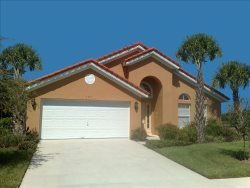 The villa is around 40 minutes from the airport at Orlando and 20 minutes from the Disney parks. The house was beautifully clean on arrival and was supplied with both swimming and bath towels which reduces the amount needed to pack. The resort itself is secure with a passcode used to access the main gate. The weather was hot when we visited so the pool was very welcome, as was the air-con throughout the villa. 410 Viola Drive is well equipped for a fantastic family holiday slightly away from the mania of the theme parks, we would definitely recommend it to anyone planning on visiting the area. "Our stay at Magical in Davenport was wonderful. We are from Canada so it was nice to be able to escape the cold for 10 days. From the very beginning, Magical was incredibly prompt with messaging. Check in was a breeze and the management company was super accommodating in letting us check in a little early once the cleaning staff had left. This was so convenient as we are travelling with a newborn. We had a few requests at the beginning: turning on the pool heat and bringing us a BBQ. The staff were super quick in dealing with this. The house itself has everything you need for a comfortable stay and they start you off with a few supplies. There are nearby gas stations, grocery store, food/restaurants all within a 10 min drive. A few of our family members spent time at Disney and it was easily accessible. We loved the community. Very quiet and lots of privacy. All in all, we had a lovely vacation and would definitely recommend this place if youre looking to relax in the sun with the comforts of home. Best part for us was the private pool and hot tub. We got lots of use out of it for sure! The games room was also a nice bonus :)"
This is our 3rd vacation rental home. It was absolutely the best. This home is elegantly appointed with the finest furniture and accessories. The kitchen is well stocked. There was dishwasher powder, liquid soap, a sponge, plenty of dish towels, a drain board, 3 pair of scissors, sippy cups, kiddie forks and spoons, a lobster pot, BBQ utensils, an ice bucket, a lighter etc. There was even a real roll of toilet paper and an extra roll in the guest bath near the game room. It was quite enjoyable to see a decorated Christmas tree in the living room, a wreath on the front door, mini Christmas trees on the kitchen pass through and the family room wall unit. There was a handicap shower chair and a potty chair for handicap adults, as well as some crutches, a porta-crib, 2 strollers and 2 high chairs. The game room had a gorgeous wooden glass top table. The ceiling fan had a remote control which was very handy . We loved our time here and cannot wait to rent this home again. It was a great place to stay and close to everything. Loved the house, so much bigger and nicer than it showed online. A winner in our books! Thanks for renting us your lovely condo. We had a great time. Everything was just as you explained, very clean and very convenient. Condo was very neat and clean. We will definitely keep you in mind for our next Florida visit. It was a real pleasure working with you. We really enjoyed our stay, we felt like we were at home. Thank you for a wonderful time and stay. We celebrate our annual vacation by going to Disney World Magic Kingdom. This was a good vacation and we enjoyed our stay! Thank you so much for allowing us to stay in your home for our 4th of July weekend getaway. First of all it was a pleasure to deal with such a nice person. Rose, you really made this process as simple as possible for us and we truly appreciate that. The home is very nicely decorated and we felt right at home the minute we came through the door. The open floor plan was also great for my disabled stepfather. All in all, it has been a wonderful experience and we are looking forward to renting with you guys again soon. Thank you. It sure was hot but fun! I love the decor! We went to Universal Studios and Island of Adventure. The Hulk was the best ride. It was comfortable to sleep in. I loved the nemo room. The Mickey Mouse room made my grandma dizzy! It was very nice. It was a real convenience because we were close to the parks. I would really visit this place again. The place was extremely big, I didnt expect it to be so big, so, it was very comfortable for all the family, the furniture is in good condition and everything was clean. The property was the perfect size for our family and the rental rate was very reasonable. We really enjoyed the pool and the game room. It was really nice to have three and a half bathrooms this was definitely a positive feature of this property. Location is ideal for Disney and close to shopping too. The property managers did a good job of having materials at the house detailing points of interest in the area and different things to do..
Just wanted to tell you that we had a wonderful stay at your home. The house was beautiful and we loved all of the extra space we had and the two grandsons spent most of the time at the house in the pool. We will give your name and house information to any of our friends that are heading that way. Once again, thank you. We thoroughly enjoyed our two-week stay at this aviana villa. The house was clean, well-stocked, spacious, and comfortable. Plenty of bedroom space, bathroom space, and a nice big family area for socializing/watching TV/or playing Wii games. We appreciated the security system in and out of the pool area, and the kids loved the game room. The neighborhood was quiet and safe, and the villa was in a convenient location for our needs. The property was tastefully decorated and felt like home. We will definitely request this house again on our next visit to the Orlando area. We had an awesome stay at the aviana Home of Kim and Tony. The house was wonderful. It was very comfortable for our family and was very spacious and decorated well. Our kids loved the pool and the game room. We liked the security of the gated community. Thanks so much we loved our stay in Florida. Our family thoroughly enjoyed their stay here. Everything you could want was there. The heated pool was rarely empty as our 8, 13, and 15 year old had a blast of fun in it. The games room and game system kept all entertained. The house was so nicely arranged as was the decor. Our stay was prior to a Caribbean cruise which was a family reunion. Others rented homes but rated this one as "the best". We agreed. We would most definitely stay again. Its location was very close to all the attractions we booked. This house has everything you need and want. Our favorite is the Mickey Mouse waffle maker. My husband had to make us Mickey Mouse waffles every day and now wants one for Fathers Day! The house is very comfortable. Our entire family went and we all enjoyed very much. We like the gated community as it made us feel safe. The community center was wonderful too! We went there and also spent a day at their pool. Magical Orlando Resorts is a very professional company and went out of their way to make our vacation wonderful! We were just there for spring break 2011 and want to return to this house. My family spent a week in this gorgeous home, and already cant wait to go back. Magical Orlando Resorts were wonderful, they were so easy to communicate with, and they offered us information about area attractions and resources to make our trip easier. I am very picky, and researched for months before I decided upon this house. I was not disappointed in the least. I have 3 year old twins, and the transition was effortless. They loved the house, and the security system for both the home, and the pool put my husband and myself at ease. The home is beautifully decorated, immaculately clean, open, bright, and airy. It was so wonderful to come home at night after a long day in the parks and truly feel at "home". Thank you for your hospitality. Our family will definitely be coming back!! We have been renting houses in Florida for the last 4 years, however this was one of the best! The pool was very refreshing and the hot tub was a great way to relax at night! The one thing that separates your home from all the others is the beds. Couldnt believe how comfortable they were! Thank you for all your help! Staff were very friendly and helpful. We were a larger group and the house was perfect. Nothing like being able to relax in the pool after a long day. The house was larger than we expected. Everyone had their own bed and lots of room. The activities in the garage were a great extra. Would highly recommend it for anyone else. This house is well kept, nicely decorated. I would say that it is a nice rental property. Thanks.